With its red-tiled roofs and wide landscaped lawns, the campus of Flager College features some of the most beautiful Spanish Renaissance architecture in the country. It is routinely named one of the most beautiful universities in the United States, which makes sense given that it was converted into a school from a former resort. The Ponce de Leon luxury hotel (now the college) was first built in 1888. Today it is listed on the National Register of Historic Places, and was one of the first buildings to granted electricity by General Electric. Often sunny, Flagler College is also a remarkably pleasant place to stroll through. Its brick archways, gleaming fountains, and tall palm trees are reminiscent of southern Spain. Luxurious details such as Tiffany stained glass windows and painted murals now adorn campus facilities such as dining halls, but that doesn’t make them any less beautiful to behold. Don’t miss the original lobby complete with an elegant 68-foot domed ceiling. 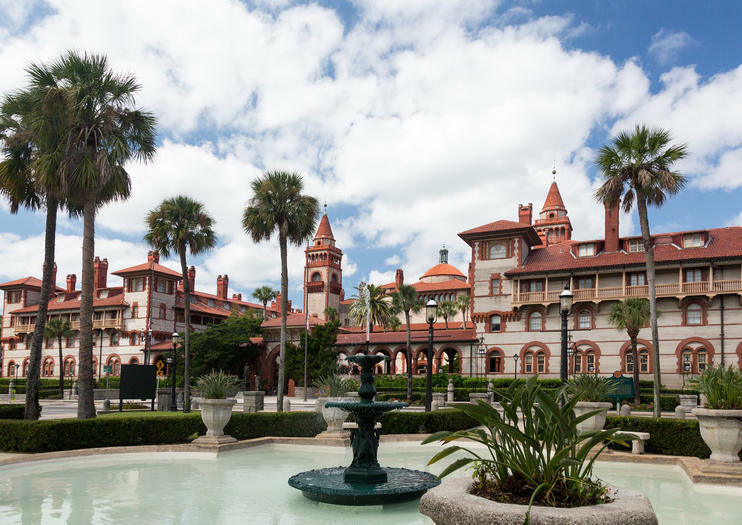 Flagler College is located on 19 acres in downtown St Augustine, just four miles from the ocean. Visitor designated parking is available at the entrance to the university. Guided tours of the campus are given daily.